I am absolutely honoured to share with you today a delicious gingerbread cookie recipe hot from the press of my fellow blogger and friend Sharon's new cook-book 'Bit of the Good Stuff'! 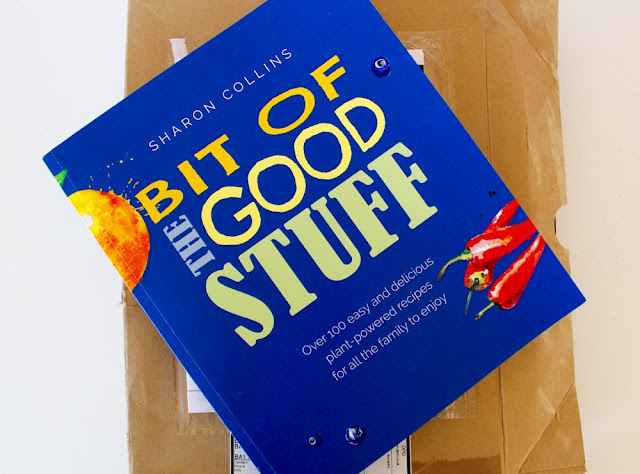 When Sharon asked me if I would like to review a recipe from her new book, I literally jumped at the chance. I have so much respect for all my blogging friends, and in particular I have a soft spot for Sharon's blog 'Bit of The Good Stuff'. She is a passionate vegan blogger and a Mum, and knows just the right kind of recipes to create for busy families. 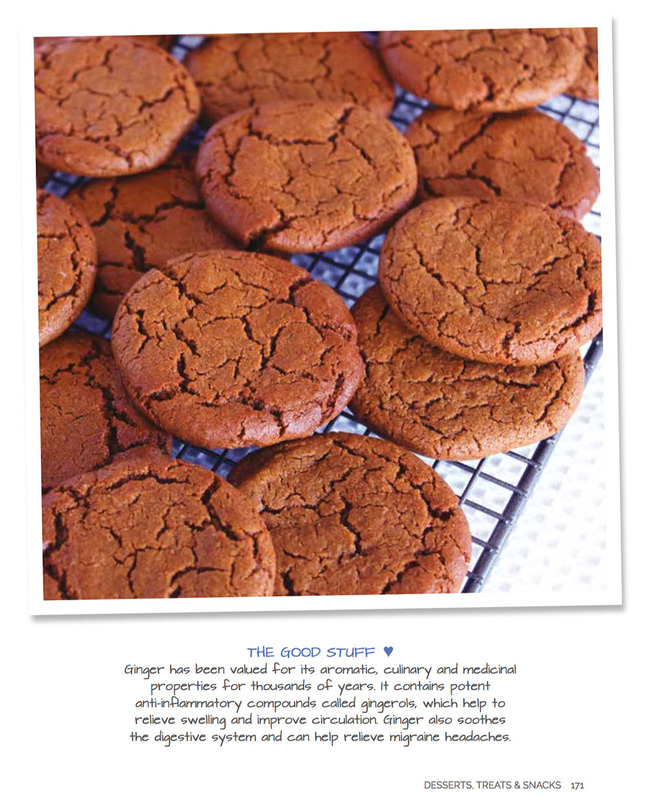 I used to love a good ginger snap biscuit growing up, but this has been the one recipe I had no idea even where to begin to make a healthier version. I don't know how Sharon worked these out, but they are perfect. Crisp on the outside, chewy in the middle, just the right amount of ginger and the top crackles beautifully. These are the perfect recipe for the Christmas season and would be a fab home-made gift too. I was really pleased with how these turned out. I think I made them a little fatter than I should have as the mixture only made 11 instead of 12, but that doesn't matter as next time I'll make a double batch- they were gone in just a few minutes! I did make a couple of substitutions in this recipe, but nothing major. Instead of regular wholemeal flour I used wholemeal spelt flour, and as I forgot to get molasses, I used date syrup which is also sticky and dark and I figured it would work- happily it did! Here's my batch, how does my picture compare...? You can buy copies of this wonderful book from the online bookshop, and I am super excited to be able to offer you a discount that will give you 15% off both the book and shipping- and this ships worldwide too. Perfect for Christmas pressies. Just enter the code ELLIE at the checkout! Preheat the oven to 200C (180C fan) / 400F. Line two baking sheets with greaseproof paper. Place the coconut sugar, oil, date syrup, soya milk and vanilla in a mixing bowl and whisk with a fork until smooth and fully combined. Place the flour, spices, baking powder, bicarb and salt in a separate bowl and stir. Tip half the dry ingredients into the wet and stir to combine. Add the remaining dry and stir together until the mixture comes together in a firm dough. Scoop slightly rounded tablespoons of dough and arrange six on each sheet. With damp fingers press the dough into a thin cookie shape. Leave the cookies on the baking sheets until they are firm, then use a spatula to remove them from the baking paper and transfer to a wire rack. When completely cool, store in an airtight container where they will keep for a couple of weeks. They also freeze well. Leave at room temperature for about 10 minutes before serving. The Ultimate Vegan Picnic Pie! 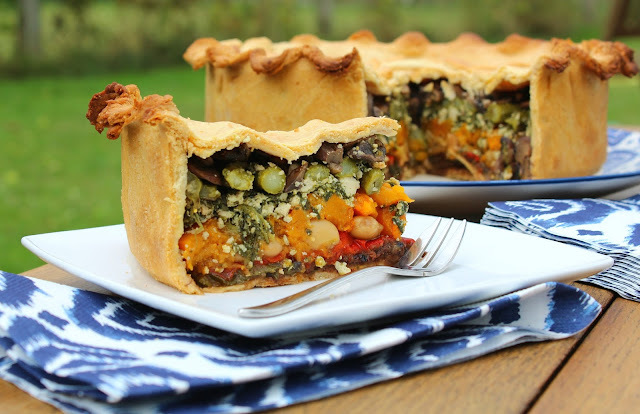 It's that time of year again when PETA UK's 'Great Vegan Bake Off' is open for entries! I love this competition and am always blown away by the vegan baking talent that's out there. It really highlights how scrummy and clever vegan baking is, there is really no missing out on any treats. This year I was very keen to enter, I was so thrilled to reach the finals last year, and I may be tempting fate to enter again, but I really wanted to give it another go. I have to admit it took me a while to decide what to make though. I was very close to entering a Key Lime Pie. I love these zesty pies, and they take me right back to age 12 when I had my first taste of one in Florida. Even today they conjure up memories of exotic palm trees and sunshine and are one of my favourite things to eat. But, even though I love those pies, I still wasn't completely sure that it was what I wanted to enter, so I had another think. After thinking it through further, I realised that while I love a good sweet treat, my heart has always been with salty, savoury foods. My cravings were always chips over chocolate and I'd often have seconds of dinner rather than a dessert. So, I have decided to enter a savoury bake! I may be mad to turn my back on sweet cakes and bakes, but at the same time I just know there are lots of who really would appreciate a really fine savoury centrepiece on the table. So here is my entry. 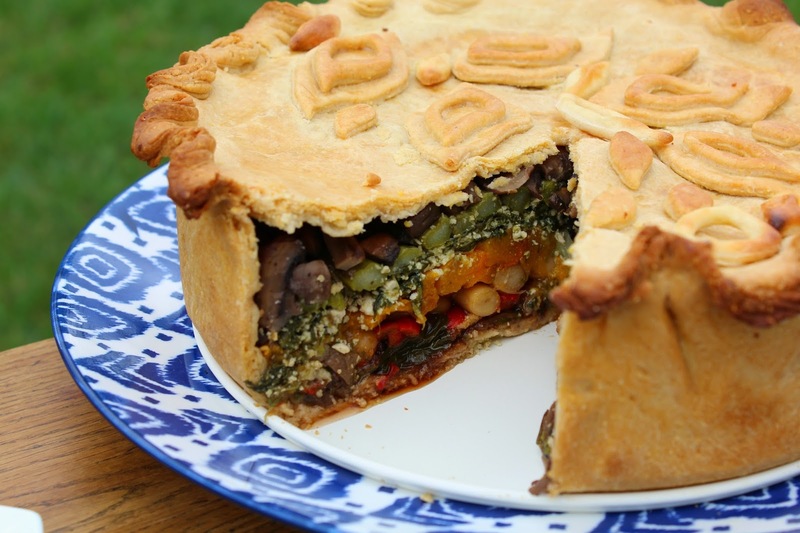 A vegan picnic pie! 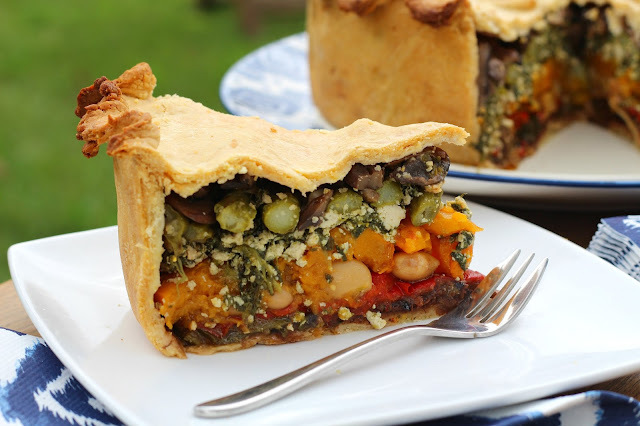 Lovely layers of delicious veggies, tofu and herbs wrapped up in a delicate polenta pasty. It's great served cold for picnics and buffets but also an impressive hot main. I am thinking of making a slight variation of this for our Christmas dinner centrepiece this year! I know there are many, many, many(!) stages to this pie. It certainly isn't your everyday recipe. 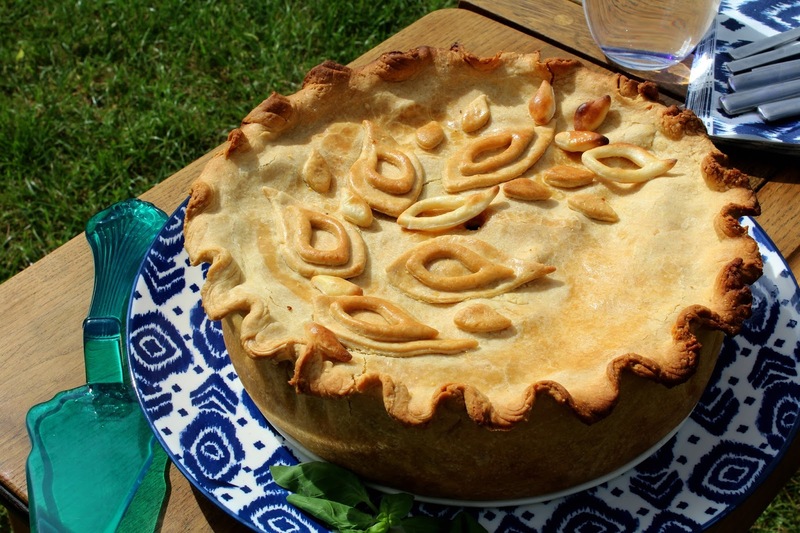 Think of it as a meal for a big get together or special occasion; a real celebratory centrepiece, a recipe for when you can take your time, perhaps with a cheeky glass of wine and a friend to help out. Saying that though, if you are pushed for time, then a cheat version can easily be thrown together. Simply buy some vegan ready made shortcrust pasty (or make it ahead of time and store in the freezer), and sub the home cooked veggies for a selection of marinated and char-grilled veggies from the deli counter at the supermarket (or even the jarred kinds from the shelves if you drain off the oil well) and you're good to go! It will look every bit as impressive, but take hardly any time at all. Before you begin this recipe, make sure you have a 23cm spring-form cake tin to bake it in! First we're going to make the pastry. Add the flour, polenta and salt to a large bowl. Add the spread and work through the flour to make a breadcrumb consistency. Add the cold water a tablespoon at a time, while mixing with your hands to create a ball of dough. Wrap in greaseproof paper or cling-film and put in the fridge to rest while you make the filling. The pastry can easily be made the night before too! 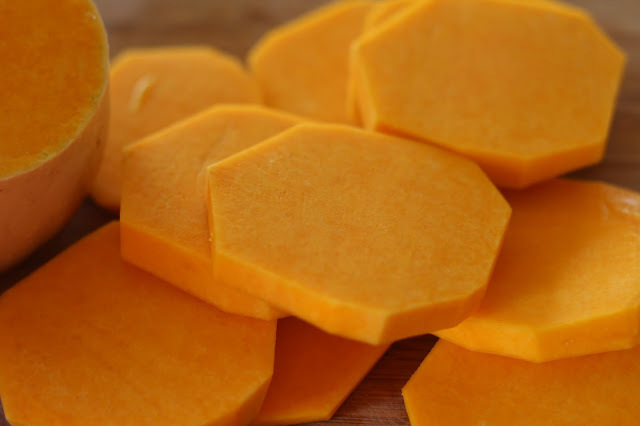 Peel the squash and slice into 1cm rounds. Place them on a baking sheet, drizzle with olive oil and season well with salt and pepper. Roast for 25mins until just cooked. Remove and set aside. Slice the courgettes into long thing ribbons, about 1/4 cm thick. Season with sea salt and pepper and cook them over a hot griddle or under a hot grill until cooked through. 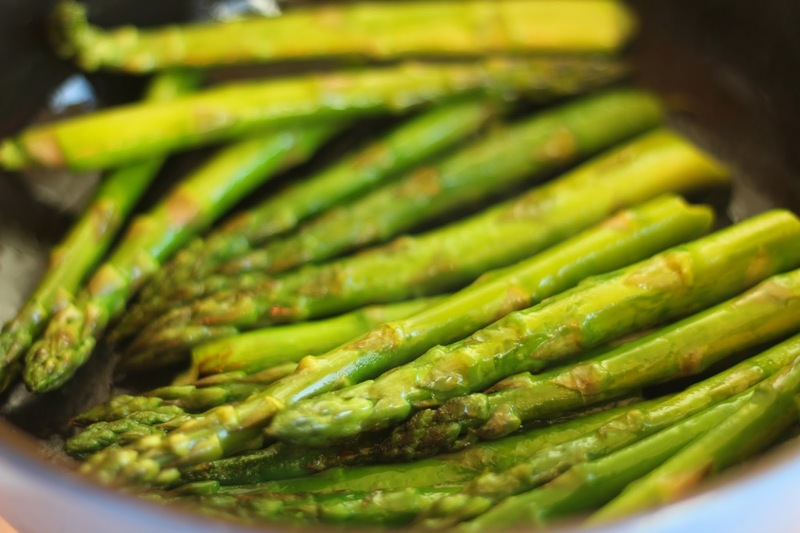 Brush the asparagus with a little olive oil and flash griddle these, just enough to see some char marks, being careful not to cook all the way through as they can go soft very easily. Set aside. Grill the peppers under a very hot grill until the skin chars. Put them in a bowl and cover with cling film and leave to steam for 10 minutes, this will make it easier to remove the skins. While the peppers are steaming, finely chop the garlic and add to a pan with some olive oil oil, slice the mushrooms and add to the pan, season with salt and pepper and sauté until cooked. Strain off the juice and set aside. When the peppers have cooled, simply peel off the skins (they should be nice and loose), cut in half and discard the seeds. Squeeze the juice out of the spinach, and add to a bowl. Season well with sea salt and black pepper. Add the nutritional yeast, and crumble in the tofu. Squeeze the mixture together really well with your hands to combine. Time to assemble the pie! Unwrap the pasty and take 2/3rds of the mixture, setting aside the other 3rd. Lightly dust a work surface and roll out the pasty into a large round, to line the tin. Take your spring-form cake tin and line the tin with the pastry, gently smoothing the sides as much as you can without tearing it. Trim off the excess from around the edges. Lay the courgette slices over the bottom of the pasty to create and even layer. Season a little more with sea salt and pepper. Spread the olive tapenade over the courgettes making sure they are covered well. 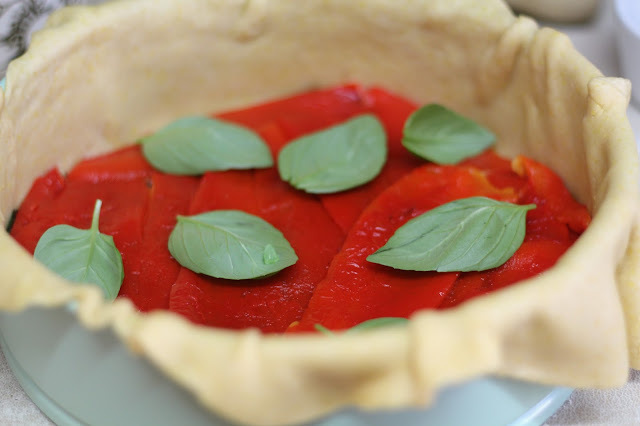 Next arrange the peppers over the courgettes, you should have enough to make two layers of peppers. Sprinkle the basil leaves over the peppers. Next pour over the butter beans. Season this layer well with sea salt and black pepper. Top the beans with a layer of roasted squash, and then spread over the tofu-spinach mixture. Next layer the asparagus over the spinach, you may need to cut them in halves to make sure you fill in all the gaps. 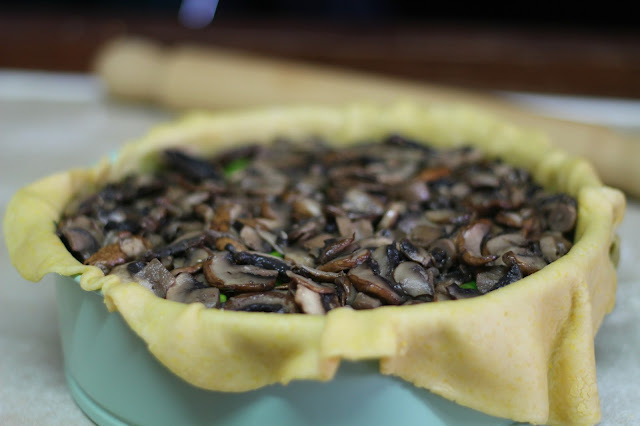 Top with the mushrooms which will come to the top of the tin! Lets get the top on! Roll out the remainder of the pastry and place over the top of the tin. 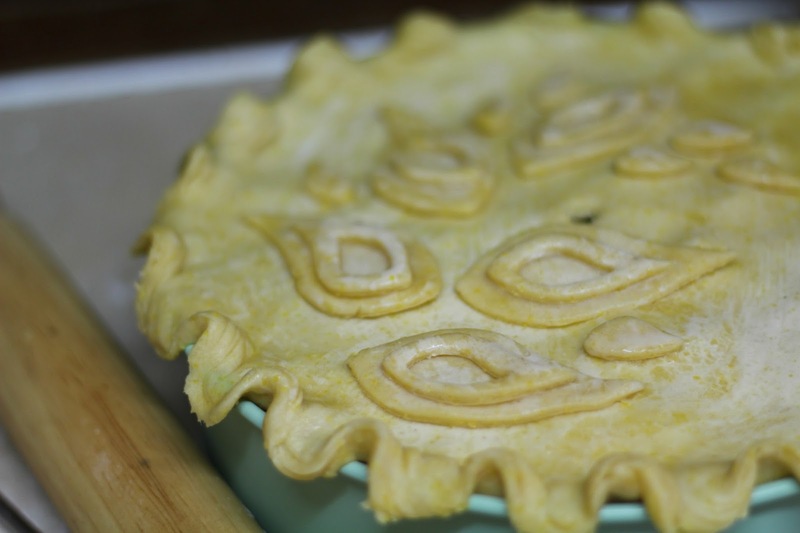 Trim off the excess and crimp the edges together with your thumb and fingers like you would to crimp a pasty. You could also seal just by pressing down with a fork. If you like at this stage you can use the excess pasty that you trimmed off to create a decoration for the pie, I like to use a leaf pattern. Make a hole in the centre of the pasty to allow the steam to come out, and then lightly brush the top with a little soya milk to create a golden crust. Cook the pie in the centre of the oven for around 50 minutes. You may need to cover the top with some tin foil after the first 30 minutes if the edges are getting too brown. Cool slightly before removing from the tin and cutting into slices. This pie tastes even better left in a fridge overnight, and makes for a perfect cold centrepiece! *Although traditionally tapenade contains anchovies, we found two varieties of jarred black olive tapenade in our local supermarket and both were vegan! We went for the one with added cumin and chilli in as it had a richer depth of flavour. Brands that are vegan are: Gaea Kalamata Tapenade, Olive Branch Chunky Tapenade and Belazu Black Olive Tapenade (which is the one we used). I created these pizza flavoured oat cakes as I've been really carefully trying to avoid consuming too many added oils in my diet. My latest bedtime reading is the Engine 2 Diet by Rip Esselstyn and I have to say it makes so much sense to me that we should be consuming wholefoods as much as possible, and this includes avoiding or minimising including oils. In his book, Rip says "Why is oil off limits? Because the Engine 2 Diet is based on a whole food, nutrient rich diet. Oil is certainly plant-based, whether it comes from olives, sunflowers or corn, but it's not a whole food. The oil you buy in stores is extracted, meaning manufacturers take, say, a bunch of beautiful olives and, instead of leaving that oil in its wonderful natural package, squeeze out the good parts (healthy fibre, vitamins, and minerals)." So while this doesn't mean I'm never going to cook again with oil, it does mean I am excited to explore the world of oil free cooking, so expect some experimentation over the next few months! So on with the first recipe- oatcakes! I am yet to find a brand that doesn't include either butter or added oil, so I figured I'd have to make my own. And why not experiment with different flavours at the same time? These little oatcakes are held together with chestnut purée, which you can buy in packets ready puréed or you can purée your own from cooked chestnuts. It's a really useful ingredient and I like to use it in cakes, pastry and desserts- it is especially good in chocolate mousse! It is also rich in protein and low in fat. At the moment it is definitely my favourite store cupboard ingredient! Blitz the oats in a food processor till slightly finer texture, you don't want it to be as fine as flour though. Add all the remaining ingredients and pulse until it comes together as a dough. Lightly sprinkle a worktop with flour (I use oat or buckwheat) and roll the dough to about 1cm thick. Using a cutter with a 4cm diameter, cut the dough into rounds. Place on a baking sheet (I line mine with a silicone sheet or greaseproof paper to keep it non stick) and bake for 8 minutes until very lightly golden. Cool for a couple of minutes and they're ready to eat! The birds are singing, the sky is blue and Spring is certainly in the air; but don't be deceived, it's still super cold out there! This week we've seen snow, hail and a chilly wind that is making me still crave comfort foods. This tropical twist on on the classic bread and butter pudding is just as satisfying as the regular version, but much lighter on the taste buds, plus it's vegan too. Made with spelt bread and low glycemic coconut palm sugar, you can enjoy this rich and tasty pudding knowing that it's packed full of wholesome ingredients! Preheat your oven to 180/350 degrees. Cut the spelt bread into around 10 slices, roughly 1cm thick. Spread them with the coconut butter or spread and cut each slice into halves. Spread half the raisins over the bottom of a 25 x25 cm square baking dish. Arrange the slices of bread in the dish so that they are slightly overlapping, and sprinkle over the rest of the raisins. Set this aside while you make the custard. Add the custard ingredients to a saucepan, and set on a medium heat. Whisk constantly for around 10 minutes or until the mixture has thickened into a custard consistency. Pour over the bread and leave to soak for around 10 minutes. Sprinkle the tablespoon of coconut palm sugar over the top, and bake for around 25 minutes until crisp and golden. For that extra tropical taste, serve this alongside griddled pineapple slices. *We like Biona Cocomega which is free from hydrogenated fats and coloured only with carrot juice! Malt extract is a sticky syrup like ingredient that is derived from barley. It has a sweet (but not too sweet) and rather unique taste that can be used as a replacement for sugar in most recipes. I confess to being slightly addicted to all things malt flavoured at the moment. It is particularly good for sweetening hot chocolate, but of course it is really best showcased in this delicious British classic; malt loaf. Malt extract has been enjoyed traditionally in the UK for generations, especially during the war when it was used as a popular children's supplement to keep colds at bay and energy levels up. While I'm not so sure it actually will keep those colds at bay, it definitely contains some nutrients (mainly B vitamins) and makes for a wiser choice than regular refined sugar. Plus its tastes amazing! This sticky, chewy loaf is the perfect tea time treat. Like a good fruit cake, the flavours and texture will develop and improve over a couple of days. So if you can resist the delicious smell when you take it out the oven, then leave it to cool, wrap it up in a little greaseproof and set aside for a day or two before enjoying. It goes wonderfully with a mug of steaming hot tea. Grease and line a 2LB loaf tin (mine is 24.5 x 14.5 x 7cm) with greaseproof paper, and set aside while you make the mix. Soak the sultanas in the tea together in a bowl for 15 minutes until the sultanas have absorbed some of the tea and are juicy and plump. Stir in the malt extract, black-strap molasses and coconut palm sugar, mixing until well distributed. Sift in the flours, baking powder, bicarb and sea salt and gently mix with a wooden spoon. Transfer to the loaf tin, and bake for an hour until cooked. Keep a close eye on it as it can burn easily; you may need to cover the top with greaseproof toward the end of cooking to prevent over browning. Test that it is done by inserting a cocktail stick into the centre, if it comes out clean, it's ready! When the loaf is done, lightly brush the top with a little more malt extract, and then leave to cool. When I outlined this post, her in the UK it was wet and windy and blowing a gale! When the weather outside is (frightful? ), all I want to do is snuggle under a blanket on the sofa with a good book and some comfort food, and this is some pretty good comfort food I promise. Served up alongside some veggies and roasted chestnuts, this is one of my all time favourite dinners. Now the sun is out, the sky is blue (I promise I'm not doing this on purpose), but it's still rather chilly outside, so give this warming dish a go, I'm sure you'll love it. But before we skip into the recipe, did I tell you guys about my exciting TV debut? Last week I had a blast making a delicious variation of the Chia Seed Pudding from 'How To Eat a Rainbow' on That's Oxford TV. It was completely nerve-racking, but once I was in the studio I had so much fun. The Presenter and crew were all so friendly and super professional which helped me lots. Hope you enjoy the video and the recipe, please give it some likes! Copies of How to Eat a Rainbow are now available in the UK at your local Grape Tree store and in the USA from Vegan Publishers and Amazon. We were kindly sent Organic Blends acai berry and chia seeds to try out in this recipe; they're fab quality and I'm sure you'll love them! Lightly oil the bottom of a large cast iron skillet or oven top casserole dish with the olive oil. Finely slice the potatoes into thin slices as possible, just a couple of mm. Arange half the potato in a layer in the dish. Top with the crushed garlic and then make a second layer with the other half of the potato slices. Top with the stock, it should cover the potatoes. Put a lid on the pan and bring to a rapid simmer. Simmer for around 20 minutes until the potatoes are soft. Finish with a sprinkle of fresh parsley and serve! The remaining liquid makes a great base for vegetable gravy, I freeze mine to use later. Indigo herbs review- part 2. Superfood Guacamole on Toast. I'm back for part 2 of my Indigo Herbs review. The thrid and final installment will be next week so please stop by for that, we'll be making something sweet and delicious with moringa powder. For this review, I wanted to tweak one of my all time favourite breakfast dishes- avocado on toast. How do you make this already yummy dish even more spectacular? By giving it an added superfood twist! I love avocados, they are filling, tasty, a healthy fat source and one of my favourite things for breakfast when served smashed on top of rye or sourdough toast. However, in a bid to shake things up a bit, I've topped this toast with a super-food guacamole with an added boost from Indigo Herbs wheatgrass powder, and finished it with a sprinkle of hemp seeds . Wheatgrass powder is amazing, but while we are all familiar with the potent wheatgrass shots, the powdered form is a little less well known. There are many ways to take the powder. It can simply be added to smoothies, veggie soups and juices, and thanks to its mild (for a green powder) taste, it can be added to other foods too. We once used it to colour some green cashew icing for a cake and it worked a treat! And, when added to this guacamole recipe, it really doesn't overpower it at all. Thanks to the other strong flavours such as lime juice, garlic and red onion, it really becomes a flavour explosion! If you're not fond of toast, serve this guacamole with veggie crudités, tortilla chips or over Mexican rice and beans for a tasty nutrition boost. Crush the garlic with the salt in a pestal and mortar. The salt breaks down the garlic in no time! Add the lime juice and the wheatgrass powder. Very finely dice the tomato and red onion and add that to the lime garlic mixture. Cut the avocado in half and take out the stone. scoop the flesh out and add to the other ingredients. Crush everything together until well mixed. I like to leave a little texture in the avocado but you can mash it until it is as smooth as you'd like.